Aruba is a Caribbean island 15 miles north of the coast of Venezuela, and is one of the four "countries" that together form the Kingdom of the Netherlands. It is 30 km (19.6 miles) long and 9 km (6 miles) across at its widest point giving it an area of approximately 70 mi² (184 km²). This flat island with no rivers is renowned for its white sand beaches and tropical climate moderated by constant trade winds from the Atlantic Ocean. The temperature is almost constant at about 27°C (81°F) and the yearly rainfall usually does not exceed 20 inches. Aruba lies outside the Caribbean hurricane belt. This beautiful island offers many activities and attractions for people of all ages. The climate is tropical marine, with little seasonal temperature variation. Because of its location south in the Caribbean there is very strong sun, but a constant light breeze keeps the temperature pleasant. (These persistent winds out of the east shape the island's distinctive, lop-sided divi-divi trees.) The divi-divi trees have become a signature tree to Aruba's landscape. The weather is almost always dry, with most rain showers coming at night and lasting only a little while. Temperatures in Aruba do not change dramatically. Between the months of January and March the temperatures stay around 76-85℉ (24-29℃) degrees; this being their high season. However starting in April and through December this is considered off season and temperatures do not change much beyond 79 and 88 degrees. It lies outside the zone usually affected by hurricanes. Discovered and claimed for Spain in 1499, Aruba was acquired by the Dutch in 1636. The island's economy has traditionally been dominated by three main industries. A 19th century gold rush was followed by prosperity brought on by the opening in 1924 of an oil refinery. The last decades of the 20th century saw a boom in the tourism industry. 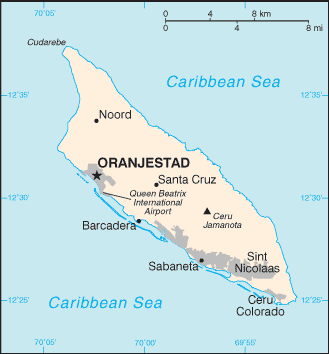 In 1986, Aruba seceded from the Netherlands Antilles (Bonaire and Curacao, which together with Aruba form the ABC-Islands) and became a separate, autonomous member of the Kingdom of the Netherlands. Movement toward full independence was halted at Aruba's request in 1990. In 1986, the oil refinery closed, which severely impacted Aruba's economy and accelerated an already-evident shift towards tourism which is now almost complete. The oil refinery reopened in 1991, closed again in 2009, reopened again in 2011, and closed again in 2012. Today, tourism is the mainstay of the small, open Aruban economy. The rapid growth of the tourism sector over the last decade has resulted in a substantial expansion of other activities. Construction boomed, with hotel capacity five times the 1985 level. The 1980s tourism boom led to a bad hangover, in that several projects ran out of money during construction and sat as half-completed eyesores until they were eventually picked up by other investors and completed during the 1990s and 2000s. To prevent a recurrence of that situation, the government imposed a building moratorium in 2007. Aruba of today has become more and more popular, many reputable travel sites rating Aruba's beaches in the top 10 of the world constantly and the best cruising ports of the Caribbean. Aruba uses 120V at 60Hz, which is identical to the US and Canadian standard. Outlets are NEMA 5 grounded outlets identical to standard wall outlets in the US and Canada. Occasionally non-grounded outlets may be found, which do not accept the third, round pin present on grounded plugs and require an adapter. Older North American outlets may not be polarised (with one slot wider than the other). Otherwise, adapters are available which accept a polarised plug and adapt it for use with a non-polarised outlet. Aruba's currency is the florin denoted by the letters 'Awg.' but also widely known as 'Afl.' The official rate at which banks accept U.S. dollar banknotes is Awg. 1,77 and checks at Awg. 1,78. The rate of exchange granted by shops and hotels ranges from Awg. 1,75 to Awg. 1,80 per U.S. dollar. U.S. Dollars are widely accepted in Aruba, and banks may exchange other foreign currency. Traveler's checks are widely accepted and there is no charge for using them in hotels, restaurants and stores. Major credit cards are accepted at most establishments while personal checks are normally not accepted. Although Sint Estatius is part of the Kingdom of Netherlands makeup, those living ouside Aruba have limited freedom to visit Aruba. Dutch nationals and citizens living outside Aruba can visit visa-free for 6 months. Those living in the countries and territories listed below can visit Aruba visa-free for 30 to 60 days. European Union/European Free Trade Association countries, Albania, Antigua and Barbuda, Argentina, Australia, Bahamas, Belize, Bosnia and Herzegovina, Brazil. Brunei, Canada, Chile, Colombia, Costa Rica, Dominica, Ecuador, El Salvador, Grenada, Guatemala, Guyana, Honduras, Hong Kong, Israel, Japan, Macau, Macedonia, Malaysia, Mauritius, Mexico, Moldova, Montenegro, New Zealand, Nicaragua, Panama, Paraguay, Saint Kitts and Nevis, Saint Lucia, Saint Vincent and the Grenadines, San Marino, Serbia, Seychelles, Singapore, Suriname, South Korea, Taiwan, Trinidad and Tobago, United Arab Emirates, United States, Vatican City, and Venezuela. Those living in British Overseas Territories must follow the same visa exempt policy as the other countries mentioned. Citizens of Canada, European Netherlands, Ireland, Saint Martin, a Schengen country, United States, United Kingdom holding a valid residence permit of the country/territory you live in are exempted from the visa requirement. Captain, crew and passengers aboard a ship or aircraft are exempt from the visa requirement for no longer than 48 hours. Those holding a official United Nations Laissez-Passer are exempt from the visa requirement. a passport that is valid upon entry and for the duration of stay in Aruba. If the tourist/traveller holds a passport from a visa required country (list A), he must have a valid visa sticker in his passport. if so requested, the tourist/traveller has to be able to prove to the satisfaction of the migration officer that they are disposed of adequate financial means to provide for hotel expenses (if applicable) and living expenses during their planned stay or that they have a declaration of guarantee from a legal resident of Aruba. Aruba has an international airport that has flights arriving daily from numerous major cities around the world. Some of the airlines that fly to and from Aruba often are American Airlines, Delta Airlines, JetBlue Airways, Southwest Airlines, Aruba Airlines, and more. All air traffic arrives and departs from the Reina Beatrix International Airport (IATA: AUA) (ICAO: TNCA) on the western side of the island. American Airlines now flies only from Miami. Other major carriers from the US include Southwest Airlines (Atlanta, Baltimore, Orlando), United (Chicago, Washington/Dulles, Newark), US Airways (Boston, Philadelphia, Charlotte), Delta (Atlanta, New York JFK), and JetBlue Airways (New York JFK, Boston). Both WestJet and Air Canada fly direct from Toronto. Copa Airlines Colombia flies to Aruba from Copa Airlines's Panama City hub, where there are connections to the entire Western Hemisphere and Europe. InselAir  has several daily flights to Curacao, and from there to 11 destinations in South America (including Medellín - Colombia and Valencia (Venezuela)), the Caribbean and Miami. You can also travel to Aruba by cruise ship. Aruba’s cruise port is in the capitol, Oranjestad. Some of the cruise companies that sail to Port of Aruba are Carnival Cruise Line, Princess Cruises, and Royal Caribbean International. Like most Caribbean islands, Aruba's transportation network consists primarily of two-lane paved roads. Oranjestad is often jammed with traffic when Aruba is full of tourists, which means that if you are staying north of Oranjestad, you must budget at least an hour each way to transit through Oranjestad. A glance at the map will reveal several possibilities for going around the worst of the traffic by heading inland, but there aren't any really good shortcuts, just long detours where the time spent going out of your way to bypass Oranjestad is almost as long as the time it would have taken you to just sit through bumper-to-bumper traffic passing through it. You can conveniently get around Aruba by car, bus, or by foot. As a tourist, it is not completely necessary to rent a car because many restaurants, beaches, and shopping areas are within walking distance. If something is not within walking distances, taxis are always available and the ride is never very long. There is also a bus line that can take you close to major tourist areas. Cabs are available at the airport and at hotels. $ 18 - Downtown, Cruise ship terminal $ 22 - Low Rise Hotels (Dutch Village to La Quinta) and Eagle area (Oceania to Amsterdam Manor) $ 25 - High Rise Hotels (Phoenix to Marriott Hotel) and Palm Beach hotels. Add USD $3 on Sundays, holidays and nights (11 PM to 7 AM). One item of luggage per person is allowed; add USD $2 for every additional piece. The bus system is called "Arubus" . This bus is great to see the island and to travel from Oranjestad to the tourist hotels all for $2.30 round-trip. You can take the bus to the far end of the island, have lunch at St Nicholas, see how the 90,000 islanders live. The bus stops at 9 PM. You can find city/island buses at a main station right downtown. During other than "rush hours", friendly drivers and some riders will help you choose routes and provide commentary on stops and sights. Fares are quite modest. An economical way to get to the resort beaches. There is a new - modern and green - trolley in downtown Oranjestad. These double-deckers run from the harbor (cruise ship port) to east of downtown along shops, small hotels and restaurants. The tram's batteries are augmented by hydrogen fuel cells, which in turn are powered by Aruba's wind turbines. The ride is quiet and free. You can also rent a car or jeep at the Queen Beatrix airport or through the hotel concierge. Because Aruba is small, consider the possibility of not renting a car until you know what you want to do. Many activities are central to the resort area of the island and are within walking distance. Renting cars/jeeps is easy, and many rental companies provide pickup service from area hotels. This is one of the easier holiday destinations to negotiate your own car around so keep the pace easy and book ahead online. If you do decide to rent a car, be aware that the local rental car companies often rent older, higher mileage cars. It's especially important to recognise that even the big brand rental car agencies will rent you a vehicle in poor condition that may or may not function properly. It may also have extensive preexisting damage in terms of both dents and flaking or scratched paint. You should make the time for a thorough walkaround at time of rental (and photograph the vehicle yourself during the process) to ensure that such preexisting damage is fully documented so that you are not charged for it upon return. Aruba rental car offices at the international airport do not operate on the model of "here's the keys, go find it yourself" seen in the U.S. While you complete all the typical rental paperwork in one of the offices across the main airport access road from the airport terminal, one of the staff members will be retrieving your vehicle from a remote lot and parking it in the alley that runs behind the offices parallel to the airport access road. That staff member will then lead you out to the vehicle and do a walkaround with you. To return the vehicle, you will follow the signs back to that alley and park in whatever spot is closest to the appropriate rental car office. A staff member on duty monitoring the alley will come over and do the walkaround to determine fuel level, mileage, new damage, etc. Don't worry if you can't get a close spot, they can spot your vehicle as theirs since Aruba is one of the countries where rental car vehicles still often include the owner's logo somewhere. You then go into the office where the clerk will reconfirm what will be charged to your credit card and close out your rental car contract. The most important thing U.S. drivers need to remember is that there are no turns on red. Also, there are several roundabouts (circles), which can be frustrating to some drivers but are quickly gotten used to. Unlike conventional roundabouts which either lack lanes altogether or have very confusing lane markings, Aruba has extensive signage and asphalt curbs which precisely indicate available movements through roundabouts and you will get used to them very quickly. Aruba uses international road signs under the Vienna Convention standard, which generally have no words or any obvious relation to their meaning. Fortunately, tourist maps usually contain quick references explaining their meaning if you are unfamiliar with them. Aruba also marks roads in the European style, meaning they use only white lines and do not use yellow lines to divide two-way opposing traffic as on the North American mainland. The island's most important road is LG Smith Boulevard (also known as Sasakiweg north of Oranjestad). Sasakiweg between Oranjestad and Palm Beach has been improved so that it is the island's only major four-lane divided highway, on which the speed limit is 80 kph (except at roundabouts, where it drops to 40). Because the island is so small, everything of interest is close to everything else of interest, and it takes special talent to get lost—if you don't know where you're going, you can basically just keep driving, and statistically speaking you are likely to end up where you need to go eventually. It should be noted, however, that most street names are not identified by signage. Even worse, many rural streets are unnamed, meaning you have to navigate them by dead reckoning or landmarks. The lack of street name signs can be especially frustrating in downtown Oranjestad. The best approach is to park in the parking lot across LG Smith Boulevard from the Renaissance Mall and Royal Plaza Mall and simply walk to your destination. A cab might also be easier than navigating the narrow unmarked streets. Take a map with you to determine what road signs mean because they are not immediately obvious. International road signs are used in Aruba. Foreign driver's licenses and International Driver Permits issued by a member country of the Geneva Convention on Road Traffic are generally valid. If your driver's license is already written in English from such a country, an IDP is not necessary. Car speedometers and road signs are in kilometres. The speed limit in urban areas is 40km/h; out of town it's 80km/h, unless a higher or lower speed is specifically indicated. Much of Oranjestad's traffic is one-way and at intersections, where there are no road signs, traffic from your right has the right of way. Aruba follows the European approach to intersection signage, where stop signs are used only when absolutely necessary and the yield sign is the predominant traffic control device. If you do see a stop sign, it really does mean stop completely (not slow to a creep or roll), usually because it's a blind intersection. Aruba Aloe Factory  – You can take a short tour and learn some interesting facts about aloe farming, production and uses. Boca Catalina and the Antilla Shipwreck – These are 2 of the many sites snorkel tours will take you. The Antillla Shipwreck is the remains of a scuttled 400-foot German cargo ship that was anchored off of Aruba during WW2. Antilla is the largest shipwreck in the Caribbean. It was thought that this ship was supplying German U-Boats in the Caribbean and after The Netherlands was invaded in 1940, the captain was given notice to surrender the ship. Instead of surrendering the ship to the Dutch Marines the captain sunk the ship by blowing up the boilers. (The crew swam to shore, and were taken POW and shipped to Bonaire.) The joke you will hear is "They did not want to surrender the cargo and they also wanted to provide future tourists with a site to see." The remains are off of Malmok beach. After the war, the captain and his crew purchased their former POW camp and converted it into a hotel. Today the site is the Divi Flamingo resort. This shipwreck can be explored either by diving or by submarine. Hooiberg (Haystack Mountain) a.k.a simply "the Haystack" – Standing over 500 feet, the haystack is in the center of the country and provides a breathtaking view of Aruba. People suggest going on a cool & clear day because it will be easier to climb the 561 steps required to reach the top and you can see the coast of Venezuela to the south! Historical Museum - contains a large collection of artifacts and paintings from Aruba's earliest times through those reminiscent of colonial times up to the present day. Eagle Beach – Often called "1 of the 10 best beaches in the world". Eagle Beach has crystal clear blue water and soft white sand that goes on for miles. This beach has calm waters with light waves. There are many different water sports offered on this beach including jet skiing and tubing. Eagle Beach is perfect for someone looking to relax and also adventure seekers. Hadikurari Beach a.k.a Fisherman's Huts. This is where the High Winds Pro AM windsurfing world championship is held every June. Bachelor's Beach- A good beach for windsurfing or snorkeling. 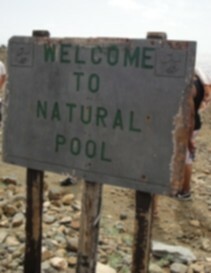 Not really good for swimming. Sailing & Snorkel- These sail and snorkel trips come with snorkel gear and many offer free beverages. The yachts sail out to coral reefs where you can see a lot of sea life and sometimes even a shipwreck. Unique Sports of Aruba, The Tranquilo, and Strea Charters are all companies that offer a sail and snorkel tour. The total snorkel and sail time is usually under 3 hours and will run you about $60 a person. Kukoo Kunuku - In Aruba the fun does not stop when the sun goes down. The Kukoo Kunuku bus is a nighttime tour bus that picks you up at your hotel lobby at around 6 p.m. From the hotel lobby, you have a champagne toast to start and then you are off to dinner at Casibari Grill, which also includes one drink. After dinner, the bus stops at three bars, with the first drink for free at each stop. A night on the Kukoo Kunuku bus will cost you $67 a person. Jet Skiing - If you are a fan of speed and thrill, jet skiing is offered as an excursion on many beaches including Eagle Beach. The cost of jet skiing for one hour is about $30 per person. American dollars are accepted virtually everywhere at a decent exchange rate. If you have U.S. dollars, there is no need to change money into the local currency, the Aruban florin. The current exchange rate (as of April 2014) given in shops is about 1.79 florins to the dollar. Because the island is a Dutch dependency, the Dutch currency (i.e., Euros) is easy to spend, and small change for purchases in dollars may be in florins. The island is actually not duty-free, but merchants respond well to competition on other islands, and duty free goods are offered by a few shops at the airport as visitors depart. Oranjestad's waterfront features many vendors/stalls selling souvenirs. Ironically, many of these souvenirs are imported from the United States with island scenes/slogans, only to be purchased by Americans and brought back to America. Experienced Mexican and Caribbean tourists may recognize some souvenirs as bearing generic island-themed designs which are lightly customized for each major Mexican and Caribbean destination. In Oranjestad, the Renaissance Mall contains various American and European major luxury brands of apparel and jewelry (i.e. Tommy Hilfiger, Polo Ralph Lauren, Gucci) at essentially the same prices as in the United States, which raises the obvious question of why they are in Aruba in the first place (since most American or European shoppers wealthy enough to buy such goods would simply buy them at home anyway). The reason is that they are catering to Aruba's large numbers of South American visitors. Most luxury brands have traditionally refrained from entering South America (or have entered and retreated) due to the political and economic instability of the region. Aruba is a good compromise location as it has a relatively stable, functioning government and is very close to South America. If you are not looking to go to an indoor mall, Caya GF Betico, is an open shopping area. This is a popular street in Aruba that is filled with luxury stores, souviener shops, jewelers, boutiques, shoe stores, and much more. You can find almost anything you need here on this street. It is recommended that you come to these shops during the early morning or late afternoon, as many of the stores are closed around lunch time. You'll find strip malls and grocers at modest (not easily walked) distances west of downtown and elsewhere. 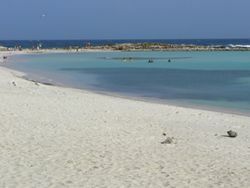 They offer almost everything a visitor or resident might need for short stays or living in Aruba. Groceries and other supplies are all imported, so prices tend to be very high. You can catch the bus from the hotel areas to the largest supermarket, Super Food, which is about 10 mins from Eagle and Palm Beaches. With numerous cruise ships visiting, downtown stores offer buys in jewelry, etc., typical of that in other Caribbean cruise ports, some at "duty free" prices. For cheese lovers, mild Dutch Gouda, in boxes or wheels, is a popular buy in supermarkets, though not the great bargain it used to be. Do ensure the integrity of the package seal from the maker to avoid spoilage and difficulty at customs inspection. If you've flown to the island, the airport duty-free store offers alcohol at one liter per person tax free. This is a significant savings over purchasing alcohol at the hotels or downtown. Gianni’s Group is a collection of five different resturants, Daniel’s Steak and Chop, Gianni’s Ristorante Italiano, Azzurro, Azia, and Amore Mio Pizzeria. These restaurants have mainly Italian food, but you can also get seafood, steak, pizza, sandwiches, and more. The restaurants range in prices. For a party of two at Amore Mio Pizzeria you can look to spend under $50 for an appetizer, beverages (non-alcoholic), and two meals. At Gianni’s Ristorante Italiano, for a party of two, you are looking to spend closer to $80. By the glass, sixpack or case, imported dutch beers are relatively good buys. Balashi Beer - Aruba's National Beer...a must-drink beverage, perfect after spending all day at the beach. Don't, however, confuse it with a "Balashi Cocktail", which is a local term for the equally enjoyable Aruban water. Founded in 1996, the name Balashi is derived from the words Bala Bala and Balana and means "near the sea." It is the only beer brewed on the island of Aruba. Daily tours of the brewery are available with an open-aired bar and restaurant on the premises. Balashi Brewery / Tel. 592-2544 / 523-6544. Balashi Gardens open from 6:30AM - 4:00PM. Tours Monday - Friday. There is also a Balashi logo store, with mostly t-shirts, and a few other things located on L.G. Smith Boulevard, right before the Harley shop and after the Caribbean Mercantile Bank. Very easy to miss but worth a trip if you enjoyed the Balashi! There is also a drive-thru beverage store next door that is nifty. Gusto is a nightclub in the Palm Beach area of Aruba. This is a nightclub for people of all ages. They have a DJ every night and they make both classic and original drinks, with happy hour (half off drinks) between 9 p.m. and 10 p.m.
Senor Frogs is located right across the street from Gusto Nightclub. Senor Frogs tailors more for a younger crowd. They also have a full food menu and are open all day long. There are an array of resorts located all over the island. See the individual city articles for listings. Aruba offers many options for sleeping arrangements. There are both hotels in downtown as well as on the beach. Some of the Hotels include; a Holiday Inn, Marriot, as well as some small local places. There is a Holiday Inn located next to the Marriot in which they share the same beach (Palm Beach). However, the Marriot is the only resort that offers a timeshare within their premise. There are two timeshare "clubs" apart of the Marriot. One is the Ocean Club which has been around for quite some time. The second is the Surf Club which was built in more recent years. The Marriot includes three swim up bars and a lazy river as well as two gyms and a casino. Also be aware tourists have been targeted, and there have been many stolen cars recently. In the Malmok beach area, just beyond the high rise 5 rental cars were stolen in 1 night. For obvious reasons, never leave your belongings in rental cars, and always make sure to lock your car doors and lock the wheel with twin hooks. After your stay in Aruba, you may never want to leave. All vacations must come to an end so when it does, your way out of Aruba is the same way you came in, by plane or boat. Don't forget your passport and other travel documents! This page was last edited on 12 March 2019, at 15:16.